Hello my friends! I pray you all had an amazing Thanksgiving with family and friends! Hubby had his first Thanksgiving off in 7 years. Unfortunately, correction officers don't automatically get holiday's off, they pretty much have to fall on their normal scheduled day off in order to get them off. I guess those are the breaks, right? Anyway, we had a really nice dinner here at home, just him, Tucker and myself. Normally after dinner clean up, we put up our Christmas tree, but this year I seem to be procrastinating. Anyone else "not feeling it"? Anyhoo, Stampin' Up! is running the annual Online Extravaganza and we're in the final hours. 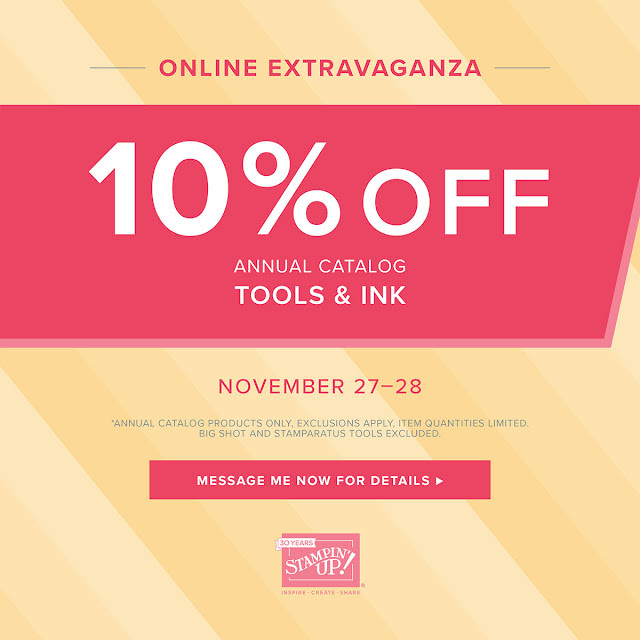 Today and tomorrow, you can save 10% on ink and tools! This includes, acrylic blocks, markers, ink refills, stamp cases, my favorite tool the paper piercing tool (aka the "pokey tool") and many other tools. (The Big Shot and the Stamparatus are NOT part of this sale)- sad, I know. So, if you have had any ink pad or refills on your wishlist, now is the time to pick them up. Need some extra blocks? Grab a few of those while you're at it. Click here to check out the sale.